It’s Easter Sunday – yet another “holiday” that isn’t a holiday for restaurant workers. That’s OK – we’re use to it. Working when others celebrate goes with the turf, this is what we do. Don’t feel sorry for us, this is the job that we either chose to do or it chose us, so we find our own way to adjust. What differs on these holidays is the clientele who patronize the restaurant, their reason for doing so, the expectations that they have, and the menus that we are inclined to offer. We fully understand that Thanksgiving, Easter, Mother’s Day, Valentine’s Day, St. Patrick’s Day, etc. bring with them an audience that is only inclined to dine out on those special occasions, is somewhat more sensitive to prices, is somewhat unfamiliar with the drill, and expecting of certain items on the menu that reflect their interpretation of food appropriate to the event. Turkey for Thanksgiving, Ham and Lamb for Easter, Beef and Chocolate for Valentine’s Day, Prime Rib for Mother’s Day, and Corned Beef for St. Patrick’s Day – yep, we get it. The problem is that cooks, in general, do not always look forward to preparing and serving these items. Although this might be tradition and yes, we all enjoy eating those items, they are less challenging for line cooks to prepare. In other words – boring. On the bright side, cooks can look forward to the challenge of serving 300 plus diners on each of those days, and in some cases significantly more. Kitchens, on days like this are transitioned into food factories with every intention of maintaining the quality that they are known for, while at the same time trying to turn tables as quickly as possible. Every holiday is a battle with Easter and Mother’s Day the culminating war. Families with children of all ages, and anxious parents and grandparents fill dining rooms with a need to satisfy tradition and less need to seek out a life changing culinary experience. So what is it like in the kitchen on one of these holidays? Keep in mind that preparation for a holiday event will likely begin two or three days prior, but this is a birds eye view of a typical Easter day in restaurant kitchens from coast to coast. 3 a.m. – The house baker arrives to finish the Danish, bake off puff pastry voluvents, fill the éclair shells and choux paste swans that were baked yesterday, pop cheesecakes in the oven, start the dough for a thousand dinner rolls to service the non-stop meal about to begin, bake off sugar cookies that will need decorating with a variety of colored icings, and fold in the cream for bavarians and mousse. The baker’s assistant will arrive at 5 a.m. (one of the only days of the year that he can count on an assistant) and with any level of luck, everything will be ready for service at 11 when brunch will begin. Easter means that the menu will evolve throughout the day, but there will not be any break in the action until the last meals are served around 9 p.m.
 4:30 a.m. – The breakfast cook is not far behind the baker and goes through the typical early morning motions for the first hour without even a word shared between he and the baker. The first batch of coffee is made for staff, ovens are fired up and the relentless number of sheet pans with layer bacon moves through ovens until five overflowing pans of crisp bacon is transferred to warmer units at the end of the line. A similar process involves breakfast sausage links infused with maple syrup, golden brown home fried potatoes, and a half dozen bone-in Smithfield hams ready for the carving station. Even though many restaurants use pre-cracked and whipped eggs delivered in cases of quart containers, this property insists on cracking their own fresh eggs. The breakfast cook drags the dishwasher over to help as they proceed to crack three cases of eggs (that’s 90 dozen) into an 80-quart Hobart for whipping. Hopefully, this will carry them through the early brunch buffet’s voracious appetite for scrambled eggs. 5 a.m. – The baker’s assistant arrives (even though the schedule states a 5 a.m. start – she is late in the baker’s mind. On time means at least 15 minutes early.) and without so much as a smile and hello she is given a list of tasks to get on immediately. Prepare 20 pounds of decorator’s icing for the cookies, begin shaping the thousand-plus dinner rolls in the Duchess machine and laying them out on sheet pans for the final proof before baking, brush the tops with egg whites and top with sesame seeds or poppy seeds, and separate 12 dozen eggs for the bavarians and mousse. In short order both will be pushed to the limit as rolls are being pushed and pulled in and out of ovens, cookies are cooled and base iced, and a plan is formed for final decorating of these signature cookies for the buffet. 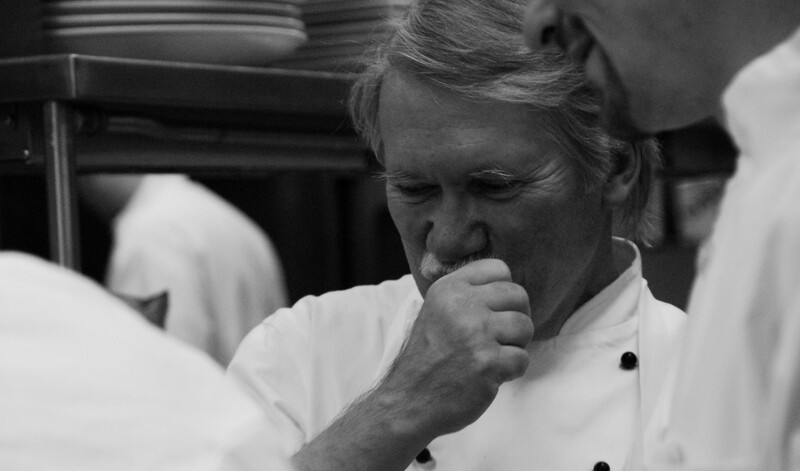 6 a.m. – The chef arrives and checks in with his early team. This is the frst time that anyone has uttered a civil hello. He grabs a cup of coffee and his clipboard with checklists as he begins to assess where everything sits. He knows that prime ribs, hams, and lamb legs will need to hit the ovens fairly soon if everything is to be ready for 11 a.m. service. The two prep cooks arrive at the same moment as the chef and by the time he makes his way to the prep area they are hard at work pulling all of the whole meats, seasoning them, panning with appropriate aromatics, and allowing to temper before they are transferred to ovens. At this point in time every oven in the kitchen is on and ready for work. By 6:30 a.m. meats will begin the cooking process based on a schedule of cook time. As soon as meats are prepped, the two cooks are quickly moving to preparation or finishing of various salads that will fill in the buffet. Waldorf salad, roasted vegetables, quinoa salad, rustic tomatoes and fresh mozzarella with basil and extra virgin olive oil, Spring mix greens with a variety of dressings, asparagus salad with caramelized onions and garlic, and fennel salad with citrus supremes and tangerine mayonnaise are all part of the agenda. 8:30 a.m. – The first shift of line cooks arrive and jump right into mise en place for their stations. Mincing garlic, making hollandaise and béchamel, slicing ham for the dreaded eggs benedict, cutting and portioning steaks, chopping parsley, clarifying butter, seeding lemons, and preparing all of the accompaniments for the omelet station. Things are coming together, but the clock seems to move even faster from this point on. They pre-poach and shock eggs in ice water, lift them into perforated pans, cover with wet side towels and transfer into coolers. 9:00 a.m. – All of the rolls are out of the ovens as are cookies. It was a bit of a battle for the past hour as oven time became a critical concern as lamb legs and hams were ready for some heat. The bakery team moved right to decorating cookies as the rolls cool on rolling racks. The kitchen at this point was maxed out. It was impossible to find a square inch of table space, a sheet pan not in use, a whisk, bowl, or cutting board without an owner, and don’t even think about finding a free burner. 9:15 a.m. – The chef pulls on his winter coat and gloves, grabs a two wheel cart, and moves on to the walk-in freezer. It is time to pull out the three ice sculptures that were made over the past few days, allow them to temper, and then grab a few able hands to lift the 300 pound sculptures into their ice pans on the buffet line. At 10 o’clock, the ice will move from walk-in coolers to waiting positions on the line. 10:15 a.m. – The line cooks transfer prime ribs, lamb legs (both at 125 degrees internal) and baked hams to warming units where they will hold at these temperatures through most of service. The chef’s table line is coming together with bacon, sausage, home fries, sauces, blanched and shocked vegetables, small ingredient mise, bain marie for hollandaise and clarified butter, poaching baths for re-heating poached eggs, and layers of fresh eggs for a ‘la carte orders. 10:00 a.m. – The ice sculptures make their way out to the dining room while the omelet station comes together and the kitchen’s young apprentice sets up his system for delivering omelets to order for the masses soon to enter the dining room. 10:30 a.m. – All hands on deck. The baker’s set up the pastry table, prep cooks carry salads out to their designated spot on the line, carving station with heat lamps is set and the carver puts an edge on her knives, and the chef walks through checking the placement, appearance, and quality of every item that carries the kitchen’s signature. The dining room manager checks plates on the line, ensures that the right serving utensil is adjacent to each chafing dish and salad bowl, instructs buffet runners and servers about the process for maintaining the integrity of the line, walks the dining room checking for table set-up, back-ups, folded napkins, and attention to every detail. In a few minutes the chef will run through a pre-meal review with the service staff, and then it’s off to the races. There are 400 reservations on the books for the brunch buffet from 11-3 and then they will switch over to a special a ‘la carte menu. But, all focus is on 11 a.m. at this point. The second shift will arrive around 12:30 and prep for the evening program will begin behind the scenes at that point. 11:00 a.m. – The chef and dining room manager shake hands – they are ready. Open the doors – Happy Easter. IF YOU ARE INTERESTED IN MORE STORIES OF THE KITCHEN, LIFE IN THE RESTAURANT BUSINESS, AND THE CHALLENGES THAT FACE RESTAURANTS TODAY AND EVERY DAY THEN YOU WILL WANT TO READ: The Event That Changed Everything. Click on the link below and order your copy today from amazon. Another great post on the life in restaurant kitchens!